You’ve got to admit, as great as they are, there are some products at Whole Foods that make you tilt your head, lift an eyebrow, and think, “who buys this?” Flavored water probably isn’t one of those things, normally. Cucumber water is refreshing. Lemon adds a little flavor. Kiwi water is delicious. 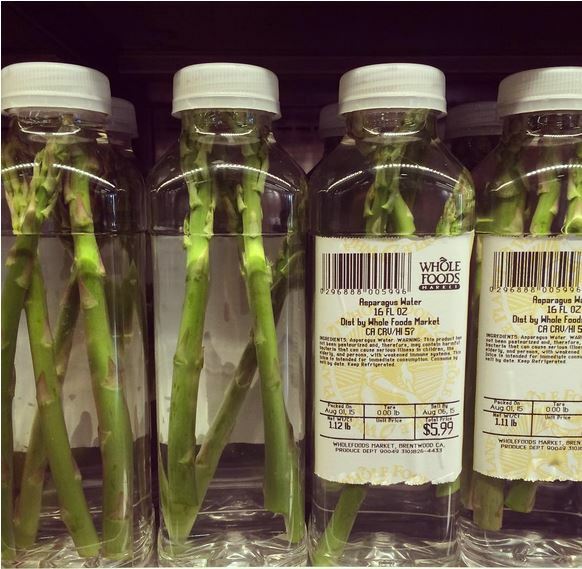 Whole Foods stepped it up a notch though, by charging $5.99 for a bottle of water with three stalks of asparagus in it. It was only available at their Brentwood, CA location and was quickly pulled from shelves with the following statement. There’s been some miscommunication around this product. It was meant to be water with the essence of vegetables and/or mushrooms to be used as broth (similar to a bone broth), which are typically made over a long period of time soaking in water. The product was made incorrectly and has since been removed from the one store, Brentwood, where it was carried. Part of me wonders if it really was a mistake or if Whole Foods was seeing if anyone would actually shell out the money for it. Those marketing departments can be sneaky sometimes. When the website Eater contacted the produce department at the local store and inquired as to how it was made the produce employee responded that they cut asparagus stalks down to fit the bottle and just put them in the water. They then wanted to know if there was a purpose behind the water. I’m pretty sure this poor guy was flying by the seat of his pants on that one. I admit, I am somewhat surprised this didn’t turn into a new hot celebrity trend.